Diagnose – Diagnose made by doctor. Medicament – Środek zapisany przez lekarza. In this example the system counts the dose of medicaments for people with Acute Sinusitis. First of all the system based on patient age and allergic to penicillin chooses one out of tree types of medicaments. Secondly, based on age and two factors the dose of medicaments is calculated. One factor is input data while second is calculated based on selected rule. In this example it is possible to distinguish two independent subsystems. One chooses type of medicaments, second sets medicaments dosing. The type of medicaments doesn't influence dosing. Dose attribute is system output that is why on level 2 there is a division that indicates dependence from other attributes. The following step is block division with tree attributes and showing relation among them. On the level 4 there are new physical attributes diagnosis, age, allergic, medication. They replace attribute Medication. 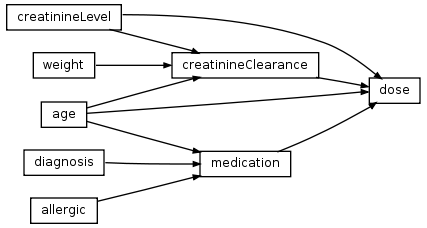 On the level 5 there is finalization of CreatinineClearance into two phisical attributes: CreatinineClearance and weight. During this transition the attribute devision in made. medication depends on diagnosis, age and allergic.